Offshore Accidents - The Gerardo Cantu Law Firm, P.C. Have you or a family member been involved in an offshore work accident? With the help of an experienced attorney, you can seek compensation for lost wages, pain and suffering, the cost of medical care and more. I am an experienced attorney. With more than 12 years of experience helping people like you get the compensation necessary to get through these difficult times. You pay nothing unless we win your case. At the personal injury law firm of The Gerardo Cantu Law Firm, P.C. 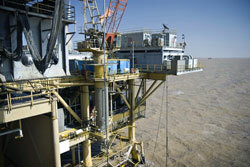 in Houston, Texas, we handle all offshore accident cases on a contingency basis. The law of the land does not always apply at sea. Instead, there are laws specifically designed to address accidents involving offshore workers. These laws include the Jones Act and the Longshoreman’s Act. In order to make an offshore workplace accident successful, a lawyer needs to understand the unique laws that apply. We understand these laws. We know how to pursue compensation for workers who have been hurt at sea. Of course, knowledge of the law is only one aspect. Investigation is another important piece of the process. We know how to navigate through every aspect of a case in order to get results. We help merchant marines, freighter employees, dock workers, oil platform workers and more in offshore accident cases. Contact us for a free consultation: Call us or send us an e-mail. Get in touch with us today to discuss your offshore accident with an experienced attorney.